Superior Painting Services, Inc. is an industry-proven commercial painting contractor serving all of North Carolina, South Carolina, and Virginia. Call us for commercial painting regardless of the size or scope of the project! Our exceptional work can be seen on shopping malls, grocery stores, franchises, restaurants and more throughout the region. Contact us for a fair, honest, guaranteed quote today. Would you shop at a store with paint peeling off the walls? Would you eat at a restaurant with an exterior that hasn’t been painted since the 1980s? 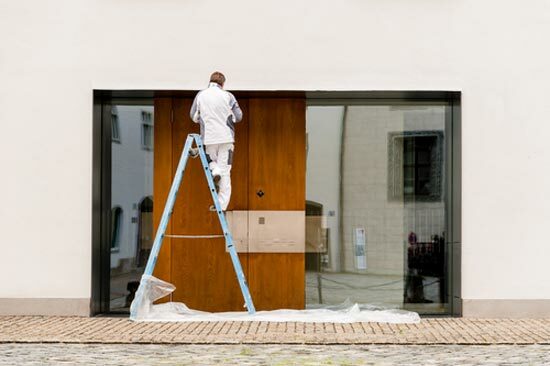 A good, clean paint job goes a long way towards making a business more appealing and more welcoming! As an experienced commercial painting company in Raleigh, NC, Superior Painting Services, Inc. has seen the transformative effects of a fresh paint job. In fact, we’ve personally delivered them to businesses of all sizes! With interior and exterior painting capabilities that span any business type of size, you can count on us to reinvigorate your retail store, restaurant, grocery store or franchise business. Our capabilities spread across any and all commercial painting in Raleigh, NC. Whether you need the existing colors and branding of your interior refreshed or you’re repainting and reinventing the exterior of your business, we put in the precision brushwork and professional skill necessary to ensure stunning results. We actually specialize in franchise locations, painting within brand guidelines to ensure your location is attractive, inviting and cohesive to the greater business. If your interior is looking downtrodden or dated, or your exterior needs a fresh coat of paint to regain its attractiveness, waste no time in contacting us. Our extensive portfolio is proof of our capabilities, and we promise results that will speak for themselves! No matter the size of the building, we’re equipped to paint it. We’ve tackled jobs in excess of 30,000 sq./ft., including large retail, grocery stores and other properties. Established in 1987, our more than 30 years of professional experience shows in every high-quality job we complete. We’re licensed painters in North Carolina, South Carolina and Virginia. We welcome projects within 4 hours in any direction out of Raleigh, NC. We ensure every quote is fair, based on market supply prices and conditions, and remain open to negotiated agreements based on each client’s needs. Our painting capabilities extend to both commercial interiors and exteriors. We can tackle completely new paint jobs or touchups for existing façades. From standalone businesses to strip malls, shopping centers and more, we’re the painting professionals to call for beautiful results that restore your building’s appeal and prestige.